Math literacy and achievement is a crucial part of education. Students with disabilities face a particular challenge as they struggle to attain proficiency in mathematics. Following are a number of assistive technology tools aimed at increasing math accessibility for students of all ability levels. High-tech tools in particular can assist students with "achieving fluency and automaticity with important information; visual-spatial organization; understanding math concepts such as number sense, time, measurement, and money; and solving word problems" (Dell, Newton, & Petroff, 2012). Click on product images for direct links to product sites. This hands-on math tool helps students with multiple math functions, offering students a concrete means of working with abstract concepts. This device accommodates students in grades K-6. It is available from Howbrite Solutions, Inc., for $13.95 and up. The Master Angle helps students accurately measure, draw, and compare angles. This overlay can be used by students at any grade level who are struggling to understand and apply angles. This tool is available from Master Innovations, LLC., for $5.95. This tool offers student a fun visual way to learn and practice fractions by providing a set of transparent overlays to illustrate parts of a whole. Students of upper elementary to early middle school grades can use the Master Fraction to practice adding and subtracting fractions, reducing, and finding decimal/percentage equivalents. The Master Fraction is available from Master Innovations, LLC., for $17.95. 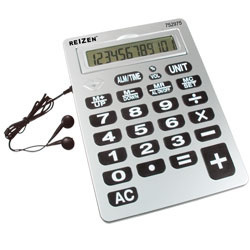 This device offers audible feedback for basic calculator functions. The keys are large to accommodate students with visual impairment or low fine motor skills, and the calculator reads back input and calculated answers. The talking calculator is available from MaxiAids for $29.95. This fun, colorful, hand-held math device teaches and reinforces money skills by offering students a visual and hands-on means of adding and subtracting values. This device is adaptable for students K-5. It is available from PCI Education for $29.95 and up. This device offers students a fun way to review and practice math facts. The Fun 'n Calc offers several games students can play to reinforce a foundation of basic math facts. Students can progress up several levels as they improve. The Fun 'n Calc is available from Franklin Electronic Publishers for $7.99. This site offers a great variety of math helps. Manipulatives are available for a wide variety of math functions and at any grade level. Please view video for more information. This site is useful for students of any grade. The web-based program is free, and upgraded software can be purchased from the publisher, Utah State University. This computer program allows students to complete their math work on the computer with all the functions of a pencil. The targeted users are students with visual or fine motor impairments who cannot hold and use a pencil. This program gives access to a critical math tool. The Virtual Pencil is available in Arithmetic and Alegebra. It is produced by Henter Math. This is a software program that offers students an electronic math worksheet that allows them to enter and solve their math problems on the computer. It offers students who have difficulty writing and organizing math material on paper a less frustrating way to work out math problems. This program is for grade levels K-8. The program is available from IntelliTools for $99.95. Dell, A.G., Newton, D. A., & Petroff, J.G. (2012). Assistive Technology in the Classroom. Upper Saddle River: Pearson.